The 5th-12th place playoffs take place on Saturday. Although away from the hullabaloo of the final, there is pride, rankings and – in one game at least – a potential place in the 2021 World Cup at stake. After great performances against Ireland and Australia, Japan will be disappointed to be ending their World Cup here - their target was a top 8 position - while Hong Kong cannot realistically have expected anything else. Does that matter? Perhaps not, given the discipline of the Japanese team, but rising to the occasion will be far easier for Hong Kong than the Cherry Blossoms. These two teams are very familiar with each other – they have played 16 times before (Japan winning 15), and last met in the home-and-away Asian Championship playoff only last month. It will be interesting to see what both sides have learnt over the past two weeks, especially Hong Kong who lost this fixture by 58-0 and 60-19 in that Asian Championship. A terrific pool game is repeated with Spain the obvious favourites after their 22-8 win last week. Italy did better than expected to not only beat Japan, but ultimately win so comfortably, while Spain perhaps struggled a little more with Hong Kong, who dominated possession and gave the Spanish defence a good workout. It is a great pity that this game is scheduled against the 7th place playoff as these two Mediterranean teams have such a great history, are so well matched, and this is also probably the last test match this Spanish team will play together. Although not officially announced (all aspects of the World Cup will be reviewed after the competition closes, so nothing is certain) it is expected that the top seven from this year’s event will qualify for 2021 – in which case there is a lot at stake in this game, which was switched from Queens to the Kingspan when Ireland lost their 7th place semi-final to Australia. The two teams know each other extremely well, invariably meeting in warm-up games to the Six Nations, as well as in the Six Nations itself. Ireland must start as favourites, not just based on recent meetings between the two teams, but on performances in this competition where Wales’ only success has come against Hong Kong whereas Ireland have beaten Japan and Australia, though they were well beaten by the latter on Tuesday. A great game on paper, wickedly scheduled against the France v USA bronze medal playoff, this will show us how much Australia have improved since losing 45-5 in Rototua in June. Even if Canada do start as favourites, there seems to be no way that scoreline will be repeated. This could also the last chance anyone will get to see this wonderfully talented Australian team until at least 2020, unless the ARU significantly changes its policy. That they can be this good based on a weekend inter-state selection tournament, a handful of tests and a few weeks of training almost defies belief. Given anything like the support offered to every other team in this tournament, Australia could easily be in the final today, not scrapping for the minor places. So make the most of it! 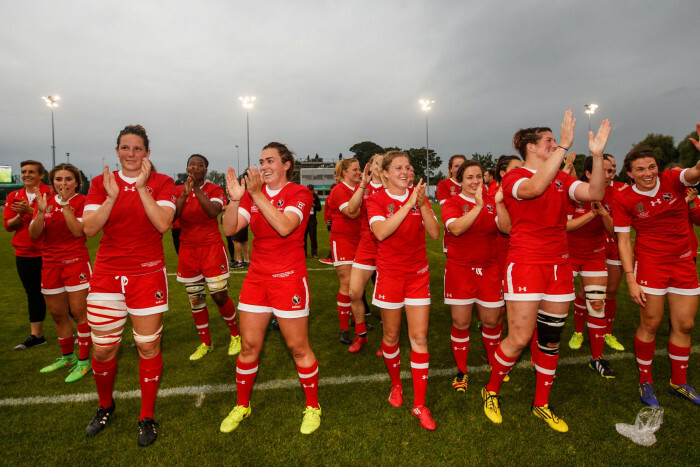 Canada thumped Wales on Tuesday and will be regretting that they had failed to do likewise the week before, otherwise they could have been at the Kingspan on finals day.